As a locally owned, independent small business, we want to thank our customers for supporting us over the last 16 years. This holiday season, we pledge to shop locally to support other local independent businesses. We’ve recently joined the Independent We Stand grassroots movement to get the word out about supporting locally-owned small businesses. With your pledge to shop locally this season, you will be helping your own community more than you know. 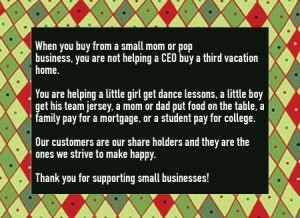 Happy Holidays and thanks for supporting local business! When we formed Harrison Fence 16 years ago, the main reason was to create a business that supported our young family while fulfilling a need in the community for quality fence contractors. We remain a family run business and take time to meet each customer’s needs one at a time. Now, 16 years later, we’ve earned the experience, expertise and skills unique to the Colorado environment, especially the rocky and uneven digging condidtions in the Boulder, CO area. We strive to provide each and every customer with the quality craftsmanship we would want at our own residence or place of business. We may not always be the cheapest bid, but we pride ourselves in using the highest quality materials, pay our workers a respectable wage and always maintain the necessary licenses and insurance to run an honest business. Sometimes it’s difficult to compete, but by sticking with our philosophy of providing quality and working with customers who value our products and services, we’ve been able to weather the ups and downs of the economy over the past decade. We would like to add you to our growing list of satisfied customers. We’d like to help you with your fence, deck, arbor, gate, railing or other outdoor home improvement projects. Chrissy or Brian will meet with you to consult about the options and provide a personalized quote for your project. Harrison Fence is available from 9:00 am to 5:00 pm Monday thru Friday. We will respond to both voice mail, email or web requests as soon as possible. All images and photographs Copyright Harrison Fence. © Copyright 2009 - 2019. All Rights Reserved.